Shopping for yoga mats can be a headache. Whether a beginner or enthusiast, there are so many features to consider: brand, price, thickness, length, color. Then there are other concerns: is the mat eco-friendly? Is it suitable for travel? Will it stand the test of time? However, one feature you might not have explored before is the mat’s cell construction and whether it’s open or closed. The concept, though easy enough to understand, isn’t often explained or even mentioned in the description of a mat. Which of course is surprising when you begin to look at how much it can impact your practice. Simply put, “open-cell” means that the mat is porous, able to absorb sweat and any other sort of moisture it might come into contact with. Popular examples include the Manduka Eko and Jade Harmony mats. With either of these (especially with the Jade mat), you’ll notice a textured surface that prevents your hands and feet from slipping. For this reason, they’re often preferred among those who take heated yoga classes. On the flip side, “closed-cell” mats are not absorbent. Think of the basic PVC mats that most studios offer for students to borrow–those are a prime example of closed-cell mats. Popular examples include the Manduka Pro, Liforme, Lululemon, and the Gaiam Print Mat. 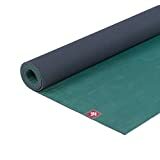 Because they don’t absorb moisture, closed-cell mats are generally not ideal for hot classes, though the Liforme, Lululemon (and a newer mat on the market, the Alo Warrior Mat), have a top layer of polyurethane, which creates a sticky, non-slip grip that’s ideal for hot yoga in the same way as the open-cell mats. Even without the polyurethane layer, practitioners with a closed-cell mat are able to buy yoga towels (full size or hands only) to absorb the sweat that the mat won’t. Now, we’ll examine the pros and cons for each type of construction, as well as look at reviews for mats that fit under those particular categories. As established, open-cell mats are ideal for heated yoga because they’re able to soak up the abundance of sweat that isn’t normally created in a gentle yoga, or even a basic yoga flow, class. This, however, comes with its drawbacks. Open-cell mats are also able to absorb bacteria, which makes them more difficult to clean. Vinegar-based cleaners are recommended, but after letting the solution sit for some time, wiping it off can be problematic. A soft, damp cloth must be used, else you risk damaging the textured surface of the mat. This, unfortunately, prevents the mat from lasting the length of time you might expect. Also, you might find that open-cell mats must be sprayed with water before class begins to offer the grip necessary for warm-up poses. One additional aspect to note about open-cell mats is that ones made of natural tree rubber can have an off-putting smell. It’s supposed to wear off after a while, but traces of it will remain (this has been especially true in the case of my Manduka Eko, which I’ve had for over a year now). The first open-cell mat in this lineup is the Jade Harmony mat. This, from my experience, is the most popular of the three mats in this category. It’s about 4.8mm thick and weighs in at 5 pounds. Like the Eko and YOGO, Jade Harmony is an eco-friendly mat with a textured surface that provides a nice grip. However, the texture is something that might not be right for you, and I would highly recommend testing a Jade Harmony before purchasing. Why? The mat has a grainy surface made up of many small “bumps” (almost like sand). Of course, you might like this sort of feeling to a mat, but it might be uncomfortable over an extended period. I have sensitive palms, and after a few poses on the Jade Harmony, I was experiencing a sensation similar to rug burn. While I wanted to love the mat and what the company stands for, this was a factor that inevitably made me decide it wasn’t right for me. On the plus side, the smell of the Jade Harmony is not as noticeable as it is with the Eko. Also, according to fellow yogis who’ve owned one long-term, the Jade Harmony appears to hold up longer than the Eko (with proper care, that is). If you prefer an eco-friendly choice, then the Manduka Eko might be the choice for you. There’s plenty of color choices, designs, and thickness (5mm for the standard, 3mm for the lite, 1.5mm for the superlite). You’ll notice that this mat has an interesting, striped texture that’s meant to keep your hands and feet from slipping. Also, the 5mm in particular provides great support for hands and knees. It’s a heavier mat, weighing in at 7 pounds, but offers both comfort and cushion to the joints. There are, however, some drawbacks. I currently own a 5mm Manduka Eko that’s a little over a year old, and the top layer has already started to wear away. This has affected its “grippiness”, which was strong during the first few months. I’ve used gentle, damp cloths as recommended, but it seems they’re still too rough on the textured surface. I’ve also used the vinegar-based spray, but it doesn’t clean as well as I hoped; if you’re like me, you might not remember to take off your makeup before practice, and, being an absorbent mat, the Eko will soak it up in poses like Child’s and Puppy. I’ve got makeup stains that won’t go away, no matter how much I clean them. Also, as mentioned above, my Eko has maintained its rubbery smell despite getting unrolled several times a week for practice. It’s particularly strong whenever I wash my hands or get in the shower after practice; the rubber residue somehow reacts when in contact with water, and the smell is unpleasant. The Yumison Skid-Resistant Hot Yoga mat is a heavy choice on the market, weighing the same as the Manduka Eko at 7 pounds, but the alignment markings will prove beneficial for any beginning yogi. Whether in Downward Dog or Warrior 2, you’ll be able to find proper stance with ease. The 4mm cushioning provides plenty of padding, and the microfiber surface offers great grip during heated classes. The mat has a beautiful mandala design, providing a nice aesthetic for your practice, and better yet, it’s machine washable. 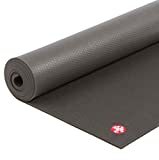 However, as with the Yoga Design Lab mat listed below, the Yumison Skid-Resistant Hot Yoga mat might not be the best choice for someone who doesn’t regularly attend heated classes. This is because the stickiness of the microfiber surface is only activated when the mat comes into contact with moisture. Another eco-friendly choice is the YOGO Ultralight mat. Weighing in at 1.9 pounds, and having a thickness of 1.5mm (the same as the Manduka Eko Superlite), it’s also one of the most travel-friendly mats on the market. 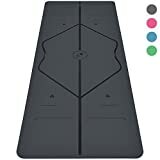 To make it more attractive than other travel mats, the YOGO can be folded and rolled into a length of 12″, and it has buckles to hold everything in place. The YOGO mat, though thin, can be placed on top of studio mats during practice, which I’ve found to be a great option when used during studio classes. It holds up great on any surface though, and provides a surprising level of “grippiness” even without moisture. The YOGO has a tiny grid-like, almost grainy texture–much different from that of the Manduka Eko (and seems to be easier to clean). Speaking of cleaning, the YOGO simplifies the process by providing straps on their mats so that you can hang them up to dry after a good wash. I don’t personally have any qualms with the YOGO mat, but I would recommend that you keep the buckles safely out of the way during practice so that you don’t step or lay on them during supine poses, which can be uncomfortable–especially if unexpected. One fun fact about YOGO is that the company plants a tree in Africa for each mat it sells, making it “super” eco-friendly! Good news: you can have a great open-cell mat without breaking the budget! The Yoga Design Lab Mat is truly one-of-a-kind; it’s a 4-pound yoga towel and mat combined into one. Topped with microfiber and attached to a layer of natural tree rubber (3.5mm of cushioning total), it provides support and comfort for all kinds of practice–especially heated. It’s silky soft to the touch, has no odor, and eliminates most of the slipping that happens on other mats due to its towel-like surface. Not only that, but you can throw it in the wash and hang to dry. Another factor to take note of is that the company gives back $1 of each purchase to children’s yoga programs. 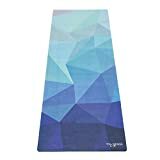 The only setback is that the Yoga Design Lab mat is made specifically for heated yoga; you may not experience the benefits this mat can provide in a gentle yoga or regular vinyasa class. This is because the mat only becomes “sticky” when wet (meaning the grip won’t be the same otherwise). The Liforme yoga mat has rapidly become popular among yogis of all levels. This is due to its unique alignment markings, similar in nature to the Yumison Skid-Resistant Hot Yoga mat. It’s a heavier mat at 5.5 pounds, but being 4mm thick, the Liforme provides stability and comfort whether you’re in a rigorous vinyasa or gentle yoga flow. The eco-polyurethane top layer has a hold like no other and has passed the sweat test in the hottest of classes. Also, the mat is a few inches wider and longer than a normal mat to accommodate practitioners of all shapes and sizes. Some say that the Liforme can be a little stiff and perhaps too sticky. Also, depending on which color you choose, it can show dirt, hair, sweat, and other materials it comes into contact with. This, however, has not diminished its reputation as a great mat for all types of practice. The Manduka Pro is, without a doubt, the largest and heaviest mat of the bunch. It varies between 7.5 and 9.5 pounds depending on the size you choose, and has a little over 6mm of padding. If you’re someone with sensitive joints, this would be a great choice for you. It provides a level of grounding and stability that few other mats on the market can offer. Being of closed-cell construction, it’s also easy to clean and doesn’t absorb bacteria. While many prefer the Manduka Pro and even go so far as to call to it their “soul mat,” it can be cumbersome to carry to and from class. Not only that, but it can become slippery in a heated class. This mat would therefore be ideal for a regular vinyasa flow, gentle flow, or restorative class. Like the Yumison Skid-Resistant Hot Yoga and Liforme mats, the Ewedoos Eco-Friendly Yoga mat has alignment cues that are great for beginning yogis. At 2 pounds and over 6mm thick, the Ewedoos mat is easy to carry to class and offers a high level of cushioning to the joints. If you’re a beginner, you’ll enjoy this feature if you’re not yet accustomed to the pressure that certain poses can put on your limbs. You can be assured that this mat will provide the stability necessary to properly learn and hold those poses. One complaint about the Ewedoos mat is that it doesn’t lay completely flat during practice. This is due to the mat’s thickness combined with its lack of weight. Also, it doesn’t handle sweat well, and the alignment lines can become deformed over time. For these reasons, the Ewedoos mat would be ideal for gentle, restorative, or regular vinyasa. The Gaiam Foldable Yoga mat is the perfect choice for a traveling yogi who wants something that’ll easily fit in a suitcase. The mat’s unique, compact shape ensures that it takes up the least amount of room as possible. It’s only 2mm thick, and when folded, it measures 10” x 12″. The surface is unique and almost gritty in nature, providing a fair amount of grip for a travel mat. As a closed-cell mat, it’s quick and easy to clean. The Gaiam Foldable mat, however, does become slippery during practice, making it an unwise choice for heated classes. Also, because of its folded shape, the Gaiam is not as flexible or easy to roll as other mats. The Gaiam Print mat is a fashionable, multi-purpose mat, loved by both novices and professionals alike. It weighs almost 2 pounds and has 3mm of padding. There are also plenty of color and design choices available that will help you stand out from the crowd. The mat has a grid-like texture, though it’s soft and flexible (as it’s made of foam). Over time, the design might begin to fade if you choose a Gaiam Print Mat (I had one for about a year-and-a-half that started to peel off due to excessive use). Also, the surface isn’t as sticky as other closed-cell mats on the market (such as those with a top layer of polyurethane). 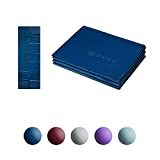 For the price though, the Gaiam Print mat is a solid choice for anyone looking to forward their practice. 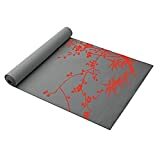 As you can see, there are countless choices when it comes to shopping for the best yoga mats. So, before making a final decision, consider what you want for your practice, then carefully evaluate each mat to see which would best fulfill your needs. There is a perfect mat waiting out there for you.